Susan B Anderson doesn’t look old enough to have four or five published books and a kid in college. 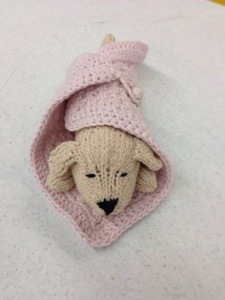 Knitting must be a great preserver, erasing lines of age from the face and lending a youthful lilt to the voice. 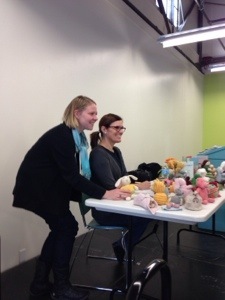 I thought all of this as I listened to Susan speak at the annual Minnesota Knitters Guild Tea this afternoon. You listen to someone like her and suddenly the idea of earning a living writing knitting books seems more approachable. She started very simply, with a few original designs and an email to a publisher…a publisher who loved her stuff and seems to have been very nurturing of its budding talent. I don’t know how common that experience is. I’m used to hearing much grimmer stories. It’s heartening. 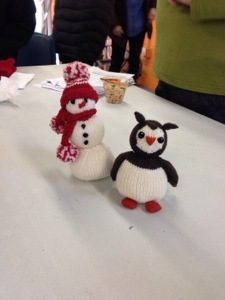 Susan brought dozens of adorable knitted toys to share with us, including a set of ingenious reversible toys. Those “topsy turvy” toys remind me of the Popples I loved in he ’80s. There was a cat that reversed into a mouse and a bunch of others I can’t recall. But I laughed at them all so they must have been good. Next chance I get, I’m going to check one of her books out at the library. I’m inspired. 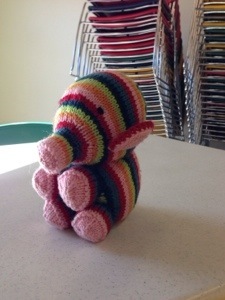 I have made two of those rainbow elephant toys. Susan has the best patterns! I’d encourage you to try out some of your own designs to send in. Do your best work and it’s likely to be accepted. Just make sure you submit it in the form the pub. requests (ask for their writer’s guidelines). Publishers often they want you to sent the actual item to them to photograph besides writing out the directions. 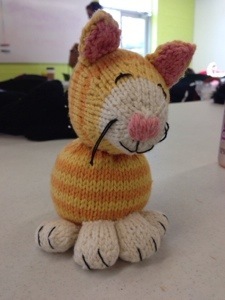 Check out some of their publications to make sure your pattern is written in a similar format. It’s not that hard as long as you do your best work.